This was a pretty fun way to spend the day before Thanksgiving. I snapped this picture right after baby got up from her nap because I knew she would cause destruction to my layout. Do you like how I left the cutest baby toes ever in the picture? 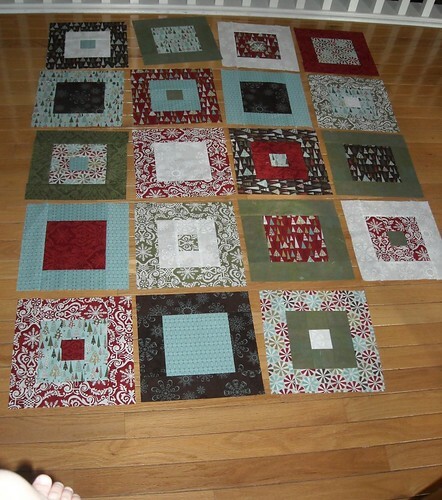 I finished an additional 5 quilt blocks after I took this picture, and I'm ready to sew the sashing on and put them all together. I think I'm going to get this UFO done, after all! Toes? We want a picture of the whole cutest baby in the world. Congrats on finishing all your blocks! It always feels great to finish something :) Can't wait to see it all done! I really like those fabrics. 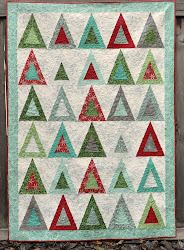 My husband wants a Christmas quilt for our bed, and usually I just hate the fabrics. This one inspires me. Love the colour coordination... Thanks for sharing... The baby toes are so cute! Fabulous looking forward to seeing the completed top!! Happy Thanksgiving! Love the fabrics. Can't wait to see it finished.